SEASON is proud to present FIERY RAIN AND MOVIES, COOLING SUN, a group show with work by Matthew F Fisher, Rob Matthews, Robyn O’Neil and Sean Pearson. Opening reception is Sunday July 15, 2-5pm and the show continues until September 30. Hours are by appointment only. Matthew F Fisher currently lives in Los Angeles and has exhibited across the United States. He has received residencies at Yaddo, Sarasota Springs, New York; The Millay Colony for the Arts in Austerlitz, New York; and the Vermont Studio Center in Johnson, Vermont. Matthew’s work has been featured in the New York Times, Time Out New York, Time Out London, New American Paintings and Art Papers. He holds an MFA from Virginia Commonwealth University. Rob Matthews lives in Nashville, Tennessee. He received his B.F.A. from the University of Tennessee, Knoxville, and his M.F.A. from the Virginia Commonwealth University. In addition to multiple solo exhibitions at various commercial galleries, Rob also had solo exhibitions at Virginia Commonwealth University, Emory and Henry College and the University of Alabama, Tuscaloosa as well as inclusion in shows at the National Portrait Gallery in Washington DC and the Arkansas Art Center in Little Rock, ARkansas. His work is held in the public collections of the Philadelphia Museum of Art, the North Carolina Museum of Art, the Pennsylvania Academy of Fine Arts and the de Young Museum in San Francisco. In 2011, he was a resident at the Ucross Foundation near Sheridan, Wyoming. Rob has received the Pew Fellowship and the Pennsylvania Council on the Arts fellowships. This will be Rob’s first showing with the gallery. Robyn O’Neil lives in Los Angeles, California. Her work was included in the 2004 Whitney Biennial and She is the recipient of numerous grants and awards, including a Joan Mitchell Foundation Grant, an Artadia grant, and the Hunting Prize. Robyn has had several traveling solo museum exhibitions in the United States, and her work is included in noted museums throughout the world. In 2010 she received a grant from the Irish Film Board to write and direct “WE, THE MASSES” which won several awards at respected film festivals upon its release. Robyn also hosts the weekly podcast “ME READING STUFF.” This will be Robyn’s first showing with the gallery. Sean Pearson is a Seattle artist working in dystopic drawings and sculptures. A constant theme in his work is alienation from an obvious peer group and a reluctant acceptance into another and how this acceptance can happen naturally, slowly, and with out recognition. Sean graduated from the Ringling College of Art and Design, Sarasota, Florida; with additional studies through the Association of Independent Colleges of Art and Design, New York, New York. His work has been show in Seattle, Brooklyn, and Los Angeles, and written about in Animal New York and ArtFCity. 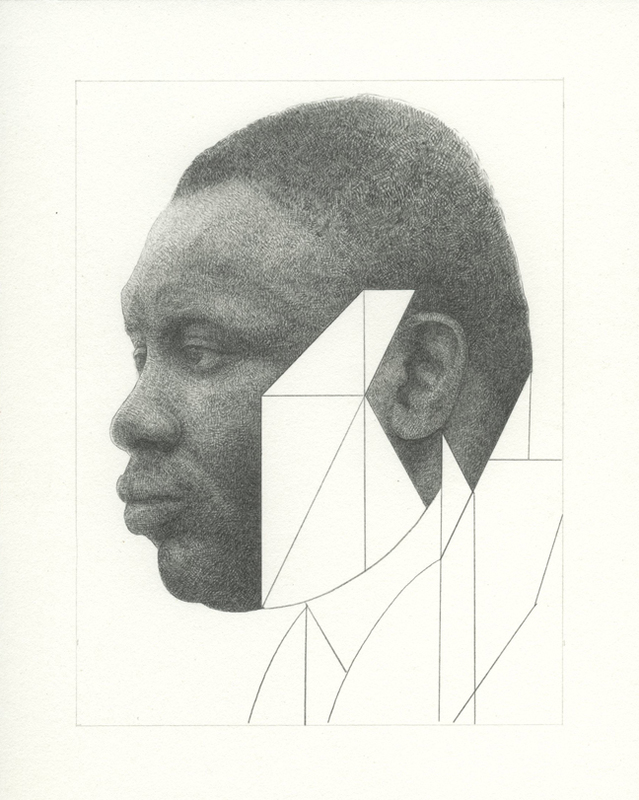 Rob Matthews, Migrant 2, 2018, graphite on paper, 6 x 4.5 inches.